Duck Duck Moose is one of our favourite developers. Their app Fish School HD was instrumental in my son's early learning phase. Now that my oldest son, Philip, is nearing his fourth birthday, Duck Duck Moose has released a brand new app that fits nicely with his current stage of learning math. Entitled Moose Math, the new app brings together five mini games designed to let juniors learn and practice basic math skills. The games allow them to learn about counting, simple algebra operations, and basic geometry. Moose Math takes place in a virtual city which you can decorate using rewards that you get from playing games. There are three main buildings where the games take place: Moose Juice, Puck's Pets, and Lost & Found. Inside Moose Juice, you will meet the friendly Moose who will guide you to play Recipe Maker. In this game, you will practice counting, addition, and subtraction by making fruit and vegetable smoothie mixes. Each mix has a predefined recipe that involves up to three different ingredients. You are asked to put in the correct number of ingredients for each type before you hit the juicer knob. Each time you make a successful play, the face on the top left corner will make a slightly bigger smile. Get the biggest smile to complete a level, and afterwards you will get an item to build and decorate your city. For example, you may get a new door, a new window, a huge tree, or even a new level for your building. Puck's Pet is the second building that you can visit. Inside the building, you will meet Puck who has two games for you. The first one is Paint Pet. In this game, you are asked to match the number of dots on the mom-and-baby snails. Just like in Recipe Maker, you will learn about counting, addition, and subtraction. The second game that Puck offers is Pet Bingo. Here your task is to catch several pets who are hiding behind a 3x3 grid. Just flip the correct number that answers an algebra equation shown on the left hand side of the screen to catch a pet. On the contrary, flipping an incorrect number will cause the pet hiding behind it to flee. To solve a grid, you have to catch three pets in a row, column, or diagonal. Note that the game may also switch to a larger 4x4 or 5x5 grid. Lost & Found is the final building in the city. Sass the shopkeeper will let you play either Dot to Dot or Lost & Found. In Dot to Dot, you need to help Dust Funny find his way back by connecting the dots according to a specific rule. For example, the rule may require you to connect the dots by counting up, counting down, counting by 2's, by 5's, or by 10's. In Lost & Found, you will learn how to identify colors and geometry shapes. For example, the game may ask you to identify three blue triangles, the longest pencil, or shapes that are different from the majority. Within each game, you can play from Level 1 to Level 6. The challenges get more difficult each time you move up a level. For example, in Pet Bingo you may be asked to solve algebra equations involving dice and numbers. Nevertheless, all challenges are suitable for juniors ages four to six. All the games in Moose Math aligns with Common Core State Standards and 21 Century Skills curriculums. If you want to learn more how each game was designed, you might want to visit the Learn section on the developer's website. You can also find free printable worksheets to help your juniors play with Moose Math games without the iPad. Moose Math allows you to create separate user profiles for multiple kids. 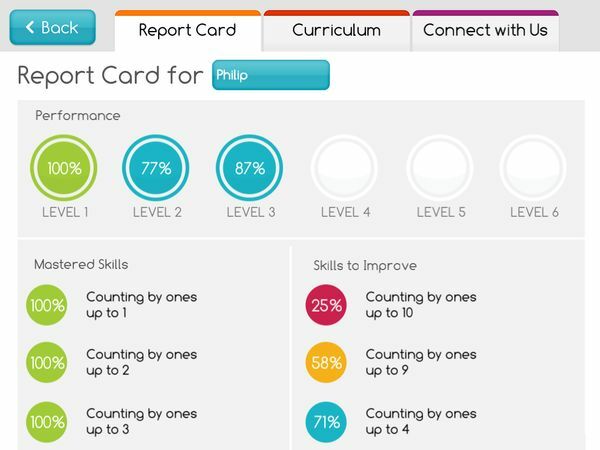 You can further track each of their progress using the Report Card feature. This allows you to gain insight of the areas that your child needs to improve. As someone who reviews educational apps everyday, I'm impressed with the creative game designs in this app. Some of them involve real world problems that you need to solve by applying algebra skills. For example, in Recipe Maker you are required to pick a number of ingredients according to a recipe. You don't always start with an empty juicer -- a few ingredients may have already been put in there. This forces you to perform simple addition/subtraction by comparing the initial state of the juicer with the recipe's requirements. The difficulty levels in the games are also well-designed. For example, in Dot to Dot you're asked to count up by 2's or by 5's only if you're able to count up by 1's and by 10's. The same goes with counting down from an arbitrary number. The app will only ask you to do it if you've mastered counting up from an arbitrary number. If your juniors manage to master a game, they can still replay that game as many times as they like. Each time they complete the challenge (by getting the biggest smile), they will get a new part for building and decorating their city. This is a nice way to motivate juniors to keep playing even though they have mastered the skills they needed to learn. Moose Math is the perfect math app for juniors ages four to six. All five games are well-designed to comply with the Common Core State Standards. I also find the Report Card really helpful to pinpoint the areas that Philip needs to improve on. Get Moose Math on the App Store. Thank you to the wonderful folks at Duck Duck Moose for sharing Moose Math with us. I'm looking forward to playing it with Philip for many hours. Bugs and Bubbles. Pop bubbles, play with bugs, and learn math in this enchanting app. Love to Count by Pirate Trio. Arr, math-ey! Sharpen your basic math skills with this pirate-themed activity app.